I will recap the Omaha trip soon, but I figured I’d better at least post something knitting-oriented, since I haven’t really posted in two weeks. 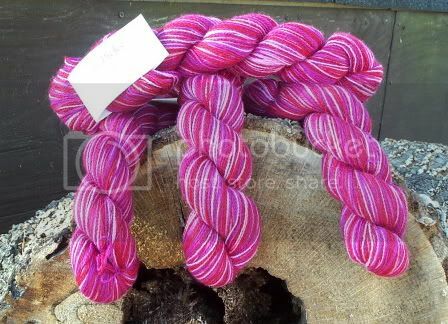 I also ordered some KnitPicks Suri Dream to make Lacey. I was leaning toward either the Fern or the Twilight colors, but Kris liked the Apricot. So, I decided to go with it. I am sensing that perhaps he would like to see me in something other than blue and green from time to time. =) The bench in the picture is really old. My grandfather used to be the borough manager for Aspinwall, PA (back in the ’70s, I think), and this was a bench that was in a park there. When they replaced them, he had two of these on his back porch, both painted yellow. When he passed away, my mother put one of them in the front yard of our house in Pittsburgh. It moved to Maryland with my folks, where it was painted green, and then to Richmond with us. We brought it back to MD when we moved up in 2004. You can’t see it in the picture, but there is a little brass plaque on the back that says “Walt’s Bench”. My uncle had it made a few years ago. Last year, I had a viola plant (My grandmother’s name was Viola) sitting on the bench. It made me feel a little bit like they were still here. I was out running some errands today, and I picked up the yarn to make the Lacy Pullover from the Winter 2005 issue of KnitSimple (pattern #15). Patons Glittalic in “Pink Sparkle”, Lacette in “Maroon Mist”, and Silverlash in “Maroon Magic”. 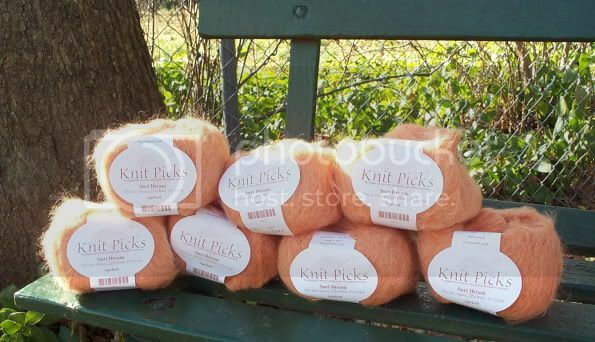 These are actually the yarns called for in the pattern, which is not normal for me – I almost always sub yarns. I did use a different color, though, so maybe that counts. It is a whole lot of pink, but I figured I would take Kris’s hint and go for it. Anyway, it’s a really pretty shade, so why not? 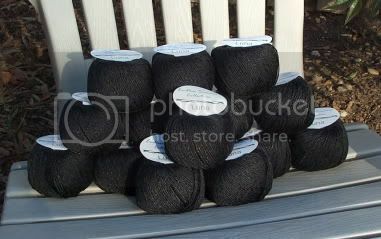 I have been drooling over two projects from elann.com, and I finally broke down and ordered the yarn for them. I had considered both of these for the Knitting Olympics, but I knew I would never get the Flickering Flames Skirt done in 16 days, and since I already have the KnitPicks Faroese Peaks Shawl on my needles, I was afraid I would be bored with the Flower Petal Shawl. The skirt will be done in Endless Summer Collection Luna in “Polished Ebony” (yes, lace in black, which was the other thing that scared me about getting it done), and the shawl will be in Peruvian Collection Pure Alpaca in “Malt Heather”. I originally wanted to make it in “Chocolate Truffle”, but they keep going out of stock on it, and I like the lighter shade, too. The Pure Alpaca is lovely yarn, and quite soft. It should make a very snuggle shawl. The Luna is a cotton/rayon blend with a very pretty shimmery/matte mixed finish. I think the skirt will look really cool when it is finished. While I was in Omaha, my postman brought me some presents. To the right are swapped goodies from alicec, knotty knit picks, and bheangrrl from the Knittyboards. On the upper right are some stitch markers that alicec sent me as a thank you for donating some leftover yarn to the knitted digestive system she is working on with her daughter. Below that is part of a set of stitch markers that bheangrrl sent me (the others are already in use on the Faroese Peaks Shawl). I forgot to put the bracelet in with it, but she also put in a beaded memory wire bracelet (the kind that coils around your wrist). The bracelet is made of blue beads specked with black, and I’ve been wearing it just about every day, because I feel like it goes really well with jeans, and I love it! 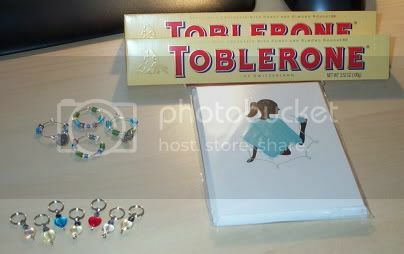 The Toblerones and note cards are from knotty knit picks. There, um, might have been another Toblerone bar and some Ferrero Raffaello candies, but they seem to have disappeared. I’m sure Kris took them. You believe me, right? Right? Today, along with the yarn, my postman brought me these lovely stitchmarkers from kdavies (also of the Knittyboard), along with some patterns that I forgot to photograph. She sent me three Heartstrings patterns – the All-over Lace Faroese Shawl, the Hanging Vines Stole, and the Oak Leaf pattern, all of which are very, very cool. 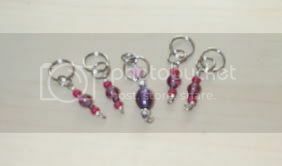 I was very excited to see that the stitch markers (which are much less blurry in person than in the picture) go really well with the Shimmer I am using for the Knitting Olympics and will therefore probably be used for that project. I did finish Kris’s Vintage Velvet scarf the other day, but I haven’t remembered to get a picture of him actually wearing it. I gave him the option of felting it or not, and he has decided that he likes it as is, so we will not be felting it. I made a little more progress on his socks while watching the Pittsburgh-Denver game. Since Pittsburgh won, I will be working on them during the Super Bowl, wearing the same yellow turtleneck and black sweater that I was wearing that day. No, I’m not at all superstitious, why do you ask? We’ll be watching the game here, and I will probably be a nervous wreck. I am not a huge football (or any sport, really) fan, but I am loyal to my Pittsburgh teams. I will pretty much always root for the Steelers, Pirates, and Penguins, no matter how they are doing or where I live. We are planning to have some friends over for the game, and I may make Primanti’s-style sandwiches, just for a Pittsbugh touch. GO STEELERS! ONE FOR THE THUMB! 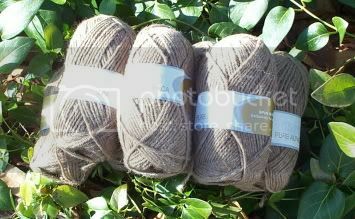 February 3rd, 2006 | Tags: Knitting, Planned Projects, Swap, Yarn Acquisitions | Category: Misc. Too funny that the log from the bee incident is still out in your yard. (OK, you know that I love that you put that in there for me, right?) That apricot color is divine! Not that all the yarn isn’t lovely. I thought you would appreciate that. I still can’t believe those three fools got away with nothing but two stings for Kris. 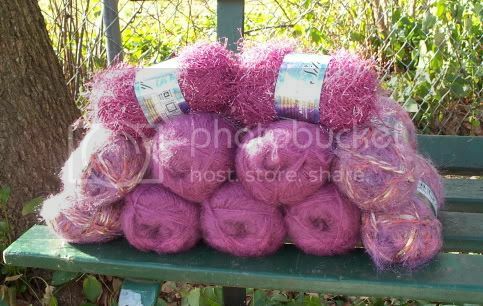 your Hush Hush yarn pic beauuuuutiful!